^ LeClaire, Jennifer. Collective Turf Coworking Set to Open in Urbana. 互联网档案馆的存檔，存档日期2011-07-07. Office Space News. April 13th, 2009. 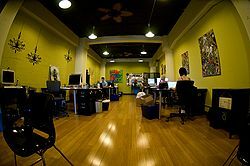 ^ DeGuzman, Genevieve and Tang, Andrew Working in the UnOffice: A Guide to Coworking for Indie Workers, Small Businesses, and Nonprofits. Night Owls Press. 28 August 2011.